A mixture of Halloween, Autumn and my favourite finds this month. I love this group of halloween pumpkins. Very 'guy', carved by DS and DGS. Always pleased to find vintage suitcases, love AeroPack by McBrine. Faces carved into a branch, creative. 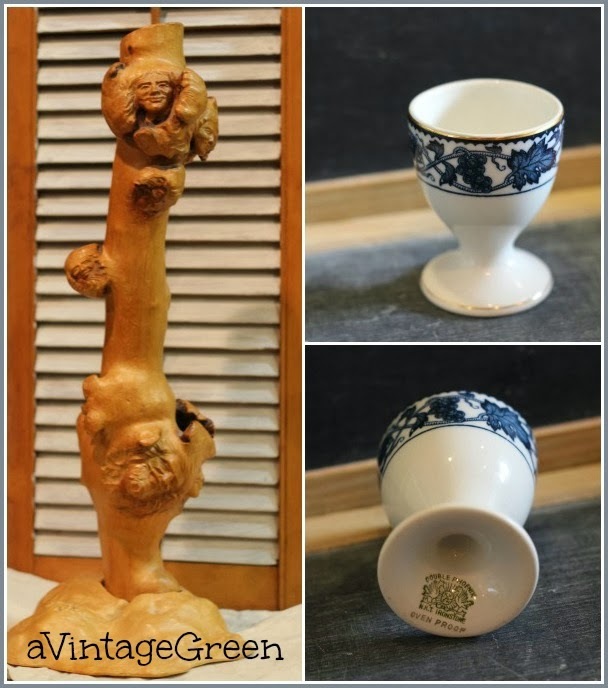 Stoneware (always looking for stoneware) Double Phoenix, grape leaves egg cup. 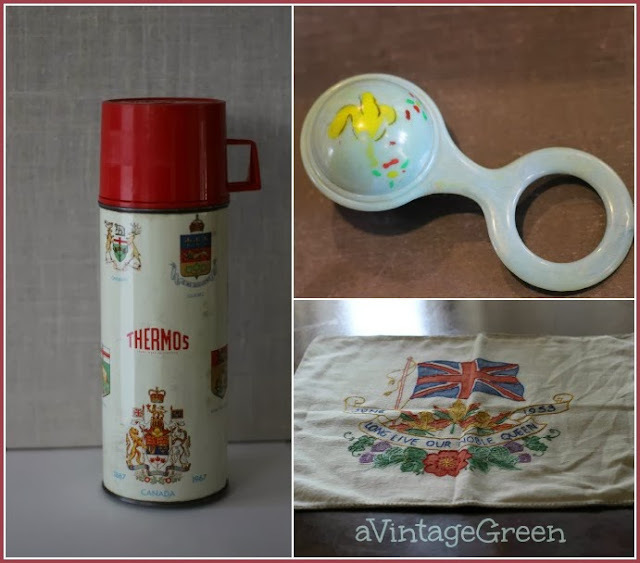 Thermos with Canadian Provincial Emblems, a vintage baby rattle and a pillowcase made in 1953, Queen Elizabeth II's Coronation. A bit of autumn as the night frosts start. Glad to to see your carved pumpkin faces and so cute and a little scary! The green coffee pots are very midcentury and excellent designs. 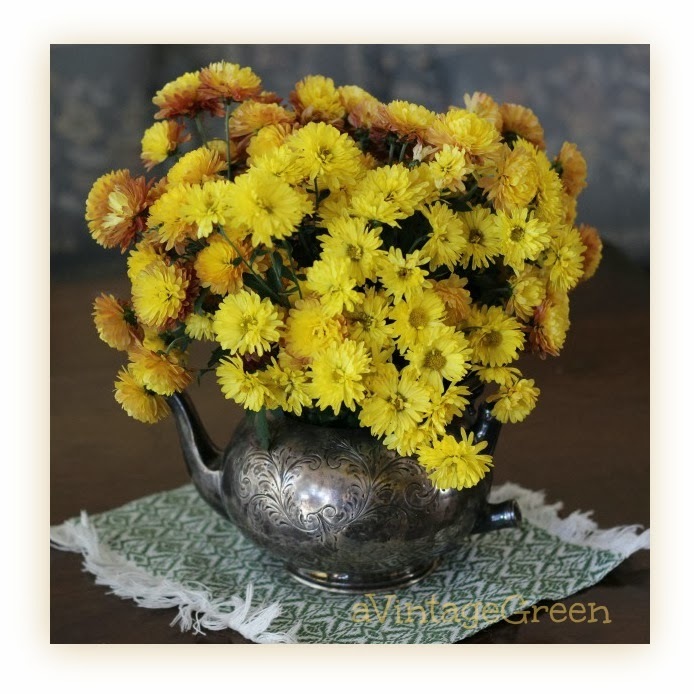 The vintage silver teapot is a wonderful container for the yellow mums. You certainly were fortunate to find so many wonderful treasures this month! Joy I love all your thrifty finds. Such unique items here! 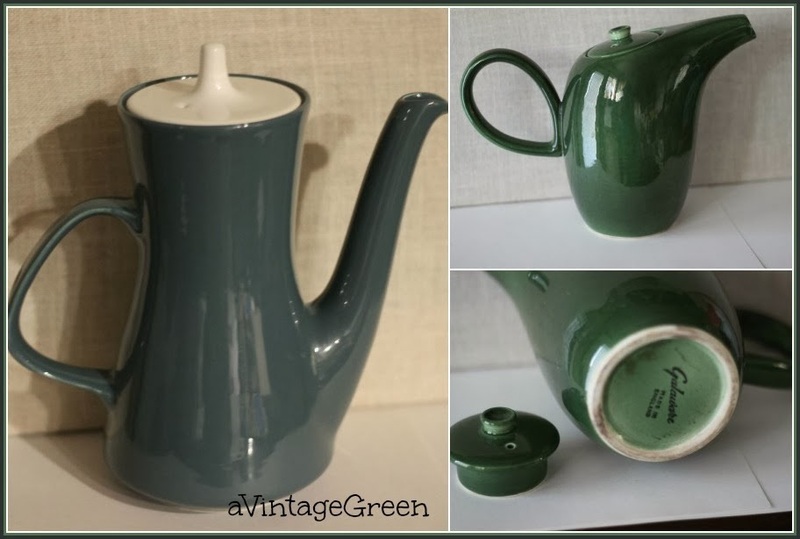 The large green teapot is so perfect for a mid=century modern home! You did have a good month finding goodies! Lots of cute and interesting stuff. Will it all go in your booth? 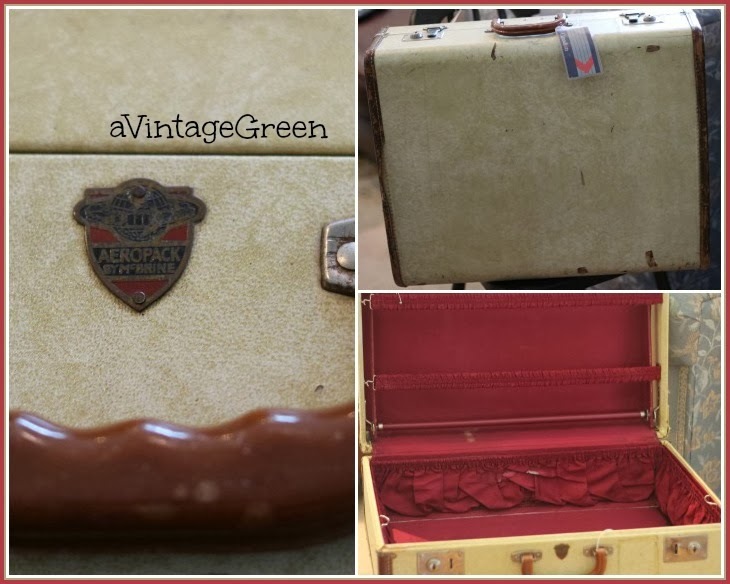 Great finds, especially that vintage suitcase. 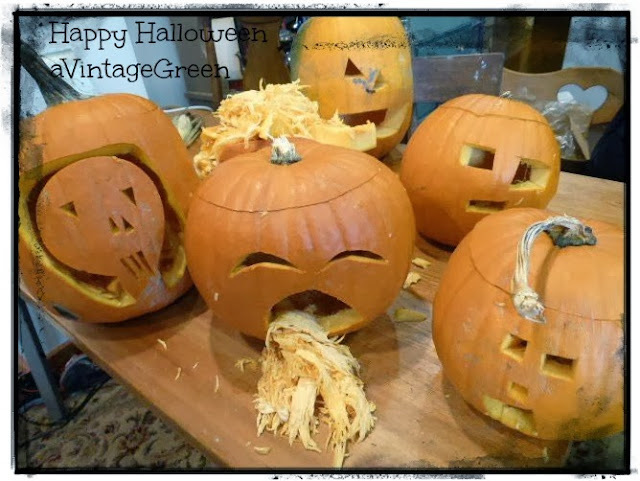 BTW, love the puking pumpkin! I love the suitcase. I am always drawn to those. The pumpkins are cute especially the one who is throwing up. LOL! Fun finds! I really like your suitcases, I have a hard time passing them up too. Love the silver pot with the beautiful fall flowers. I love the fun pumpkins Joy. Great finds. Especially love the suitcase ! Placing the mum in the teapot gives it a wonderful vintage feel. Those pumpkins are pretty cute ... I bet they got a lot of laughs while doing them. Not easy, but fun. 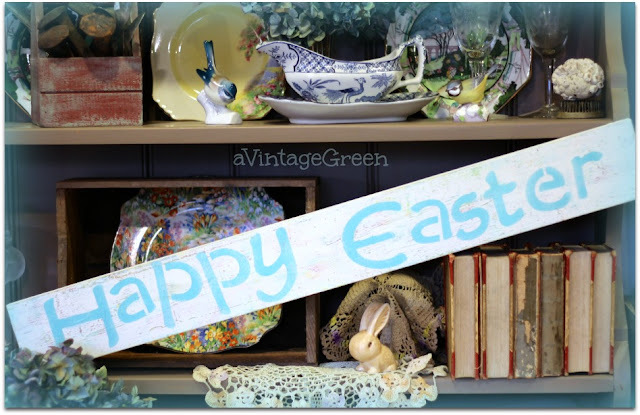 My favorite is the stoneware egg cups ... and the silver pot with the yellow flowers would fit in my collection just fine. You did well with your finds. I like the suitcase best and I'm still loving the mums in the teapot! Thanks for sharing at my HOME and have a wonderful weekend. Those pumpkins are great! You have some great finds! That teapot and coffee pot are so beautiful! What a neat find - the Coronation pillowcase!!! You were lucky findng so many great finds. I am sure you will find just the right spot to use them.